When reading this book, I saw the weaknesses with some of Rowling’s writing. Notably her overuse of certain words (in this case, I counted “salubrious” twice early on) and plot holes. I think her editor could have caught a couple of things. Though I do wonder because with big name authors, editors seem to be less open to suggesting things. In any case, these are minor quibbles. The mystery was fine. I had an idea who the killer was early on, but Rowling kept throwing lots of red herrings on the way to throw me off. I am noticing that fame and envy are big themes in this series. Cormoran’s own life has themes of these with his family history and his relationship history. I would like Cormoran more as a character even he did not spend so much time thinking about Charlotte. I don’t like the idea of Charlotte or any character whose primary physical appearance is “beautiful” or so attractive that she made heads turn. Beauty is in the eye of the beholder and I’m irked by Charlotte’s behavior. 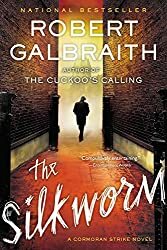 Thankfully she does not show up in this book at all and Cormoran shows more character development by getting over her. I do like the supporting cast a lot and not just Robin. I like Cormoran’s childhood friends and his brother Al. I like Cormoran more when they are around them too. I can only take so much of the anti-hero stuff.